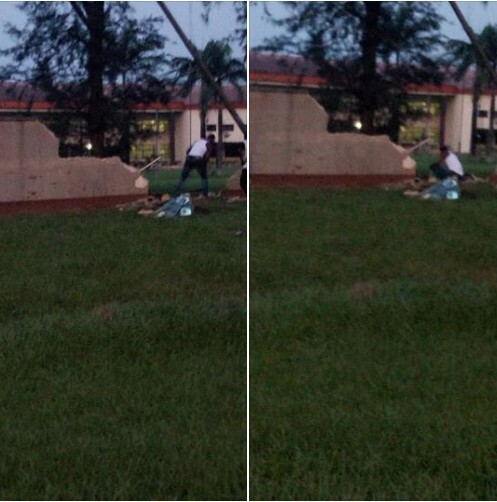 A bus ran into a section of the Akwa Ibom State House of Assembly perimeter fence, fueling rumours that the sacked lawmakers may have hatched another ploy to gain access into the 6th Assembly chambers. According to reports, the incident happened on Sunday evening (yesterday). "It is suspected to be a ploy by Idongesit Ituen and his co-travellers to create an opening for an illegal entry into the chambers," a security operative allegedly said. The bus overshot the gutter and rammed into a section of the fence, leaving an opening close to the House of Assembly chambers section of the complex. The security men at the House of Assembly arrested the driver and whisked him away for interrogation. Meanwhile remedial work is ongoing to fix the fence under the strict supervision of the Assembly security agents.